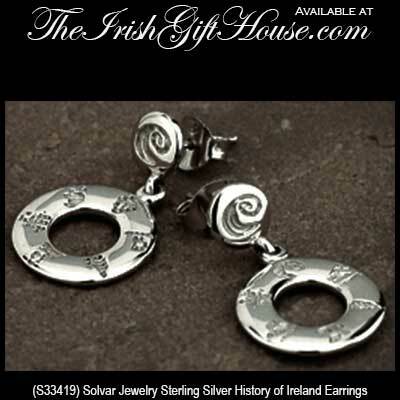 These doughnut shape History of Ireland drop earrings are crafted in sterling silver and they measure 5/8" wide x 1” tall. Half of the twelve History of Ireland icons are engraved on each of the drop earrings that are fitted on posts with butterfly backs. History of Ireland brooch is a large sterling silver design that will complement any blouse of jacket.